Insanity MAX:30 Review - Which Home Workout? Insanity MAX:30 is a challenging home workout program that beginners will likely struggle to complete, therefore it is recommended only for advanced users. Some people may be put off buying this due to the assumption that it will be too similar to the original Insanity. however, this is not the case: both programs use the Insanity name and that is where the similarities end. 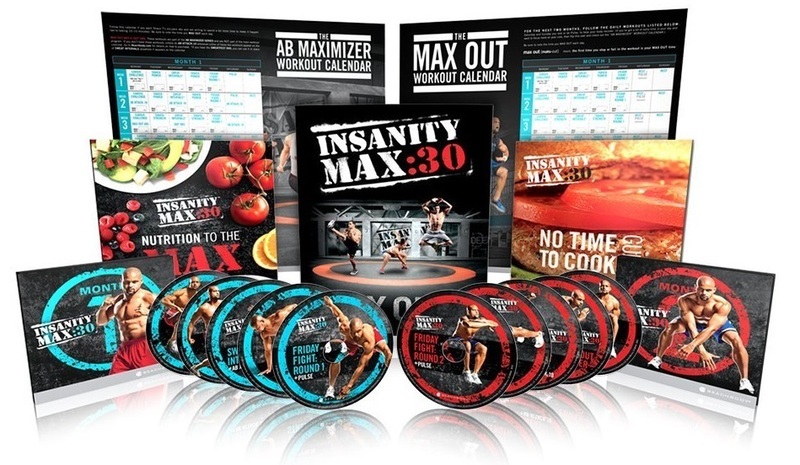 Insanity MAX:30 boasts 150 new exercises and utilizes a whole new method of training called Maxing Out. In short, if you enjoyed Insanity and/or you're looking for a new challenge which offers more convenience, then Insanity MAX:30 is perfect for you. When I decided to try Insanity MAX: 30, another Beachbody home workout program, I’ll admit I was slightly skeptical. For some context, I’m a moderately fit guy with a fair amount of experience of using home workout programs (which you’ll know, if you’ve read any of my other home workout program reviews), and I was looking for something to push myself a bit further. I didn’t go into this process expecting any significant results – certainly nothing compared to the results I achieved with some other workout programs. I’m a huge fan of the regular Insanity and P90X3, among other workout at home DVDs, so I wasn’t sure that a condensed version would be able to deliver results. But, dear lord, Insanity MAX:30 pushed me to my fitness limits and brought me to soaring new workout heights, and I am now a converted MAX:30 devotee, come to preach the gospel of Shaun T’s home workout voodoo like the fitness junkie I am. This Insanity MAX:30 review will explain the highs and occasional lows of the program, give an overview of what’s included, and give you an honest account of my experience with it. Read on to learn more in this Insanity MAX:30 review or, if you’re pushed for time, skip to the kit comparison section to learn what’s included in the different bundles and where to get Insanity MAX:30. Insanity MAX:30 was created five years after the the inception of the original Insanity in response to the fact that the duration of the workouts in the original Insanity were too long for some people. Shaun T and the BeachBody gang clearly realised how convenient shorter workouts were during the launch of Focus T25 (another home workout program based on shorter workouts – read my Focus T25 review here) and capitalized on that by re-releasing a condensed version of the classic Insanity. The whole program operates on a unique fitness concept called “Maxing Out.” Basically, you go as hard as you can for as long as you can until you collapse on your living room floor in a pool of your own sweat and tears. You then resume the workout after you’ve rested and once again push yourself until you physically can’t push yourself any longer, AKA you’ve maxed out again! Stop and rest. This cycle of maxing out then resting repeats until the 30-minute workout is complete. Each time you max out, you write down how long you were able to exercise before you had to stop and rest, then attempt to beat that time. You repeat this process every day, with the goal of increasing your max out time, until, hopefully, you can do all 30 minutes without maxing out at all (good luck with that!). No, really. 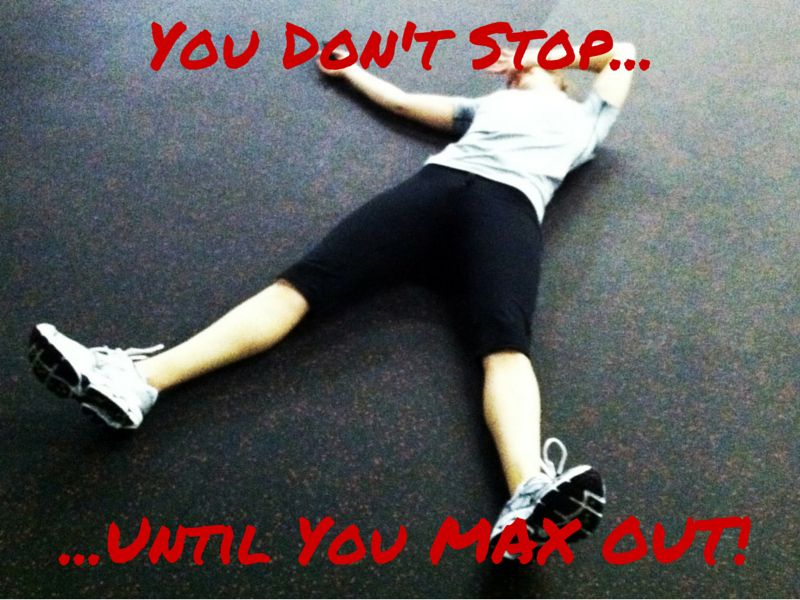 You don’t stop until you max out. In the beginning, trying to do all 30 minutes in one go is hopelessly idealistic, so don’t beat yourself up if you max out while you’re still in the single digits of your minute count. You don’t feel too bad for resting when you see the athletes with Shaun, who are clearly super-fit, having to rest. For my first workout, I made it to seven minutes, wrote down my time, and limped back into the rest of the workout with my tail slightly between my legs, exhausted but undaunted. Insanity MAX:30 Review – What’s In The Box? A lot, despite the fact there’s no physical equipment with this program. MAX:30, like other Beachbody programs, is a very full-featured workout package. For simplicity’s sake, I’m going to break each item down and detail what it is and how I felt about it. Pretty standard Beachbody procedure here. If you’ve ever used one of Beachbody’s other home workout programs, you’ll be familiar with it, but if not, it’s 12 workouts on 10 DVDs. This is a helpful and simple nutrition guide that stresses eating clean and in moderation. It would be really helpful for someone new to fitness, but even though I’m someone who has been eating clean (or trying to, anyway. Cue guilty look at last night’s cheat meal leftovers…) for a few years, I still found using the nutrition guide useful. There are two tracks you can follow that are helpfully color-coded: blue if you’re under 150 pounds, and red if you’re over. You don’t count calories, and the focus is on cutting body fat by keeping track of the types of food you eat (fruit, veggie, protein, etc). It’s really nice for making sure you get a balance of foods, and I like the program’s emphasis on healthy fats. This little booklet explains how this home workout program works and how to get the best results with it. It talks about the training method, but it wasn’t the most helpful thing for me, if only because the program is really easy to follow and doesn’t need a lot of explaining. Like the nutrition guide, it is beautifully laid out and gets right to the point, which is great. This is a wall calendar that details which workout DVD to do each day, and leaves a space to write out the time you maxed out. I loved this thing. At first I thought it was gimmicky, but it was so unbelievably satisfying to see my max out times increase steadily as I worked through the program, and it helped me identify which days weren’t as good as others. When I workout at home, I sometimes find it difficult to keep track of my progress because the scenery never changes and I don’t use equipment, so I really enjoyed using the calendar to watch my progress. The calendar is also useful for not mixing up your workout days, and it is just plain cool to look at. This is a small thing, but the whole calendar just looks nice. You won’t mind having it up on your wall. This booklet was interesting, and it was one of the included items that taught me the most new information. It teaches you how to order out while still eating clean (ish), something that always throws me off my game. I found myself using some of the tips in this booklet (dressing on the side, guys, just do it!) to keep me on track, and I think it made a big difference in my ability to eat clean during the two months I was doing the workout. Overall, useful and engaging. I haven’t actually used BeachBody customer service before, because I’ve never had a problem with my products, but I hear their customer service is good and it’s nice to know that if something went wrong or I broke something there are people standing by to help me out. Actual people, too, not robots. Insanity MAX:30 Review – What It Like To Use? The alpha stage was hard. Then Beta was harder. It’s a steep incline of intensity, and it is effective. Shaun leaves no room for you to get comfortable in your workouts, constantly pushing you to your limit in a way that is both encouraging and brutal. No rest, no excuses, and you bet you’ll be feeling a burn the next day. Pro tip: avoid stairs. And laughing. The cool downs after the workouts might not be enough for some people, so if you need it, you may want to take some additional time to stretch after the DVD ends. I think they stretch less in an effort to keep the time down, which I understand. Again, listen to your body and never sacrifice on form when working out. When you feel your form slipping, it means it’s time to max out and rest. Maxing out as a workout concept worked really well for me. Going as hard as you can for as long as you can turns working out into a personal challenge, and writing it down lets you track your results. The videos all have a max out clock in the corner of the video, so you know when you finally break and can write it down on your wall calendar. Speaking of the videos, the production quality is, as ever, really high. Multiple cameras, a good cast, and, praise be, excellent music. Max 30 definitely has my favorite soundtrack to date. It’s energizing and fun, but not distracting or irritating. You can also hear everything the trainer says. The workout cast are all fit and pleasant to look at, and it was really validating to see them sweating, obviously feeling the burn right along with you. One of the things that I like best about this program is the coach, Shaun T. I’ve said it before and I’ll say it again, Shaun is motivating, fun, and demanding as hell. His program is difficult, he even says it’s the hardest program he’s ever done, and you can tell that even he’s feeling the burn when you’re watching him up there. He’ll push you, and I mean really push you, until you collapse and think you’re never moving again. But then his supportive banter and encouragement will lift you back up again. Shaun is definitely my favorite trainer of the Beachbody bunch, but he’s also one of the most demanding. As far as equipment and other tools needed, there are none. The whole program uses good old-fashioned body weight and gravity to work you half to death, and believe me, it is enough. If you’re used to doing a lot of weight training in your workouts, you could supplement with another program, but I felt very satisfied with the amount of resistance training I did in the program, and by the end of the two weeks I had some real muscle definition that proved to me that the program does good things for abs. It’s definitely more challenging than, say, Focus T25 or PiYo, and it’s much different than the original Insanity program. For one thing, MAX:30 is a lot shorter and more intense. Insanity gives you an hour of tough workout, but MAX:30 is like Insanity’s no frills cousin who eats raw protein powder for breakfast. There are no breaks, and it is intense and time efficient like you wouldn’t believe. The program is two months long and is broken down into two stages: alpha and beta. Alpha is the foundation stage and takes place during the first month, and beta is naturally more difficult and happens in the second month. You do the same five workouts per week for the first month, and then the second month has more difficult routines to switch to on new DVDs. I appreciate this because it continues to increase your strength levels and never lets the program get too easy. An aptly named cardio-based workout that gets you warmed up (to say the least!) for the week ahead. It begins with the typical warm-up circuit that’s completed twice and takes a total of 5 minutes. If you’ve completed the original Insanity you will notice an element of familiarity with both the warm-up and main workout, as some of the original exercises are included, however, there are significantly more exercises per workout this time round so expect to perform a lot of new moves. Another cardio-focused workout which incorporates high intensity interval training. The warm-up is similar to the one in cardio challenge – some similar moves, some new ones. The main workout consists of a succession of increasingly difficult circuits, introducing more new moves. A resistance-based workout modelled on the tabata principle. Both tabata workouts start with a warm-up that’s slightly less intense than the cardio challenge / sweat intervals workouts, but incorporates more strength exercises. The main workout follows a similar structure, with a range of exercises such as squats and many push-up variations, with a particular emphasis on developing shoulder and chest muscles. The second resistance-based workout which utilizes an adapted tabata principle with an emphasis on building strength. Expect some push-ups and lots of squats and lunges, as tabata strength appears to focus more on the core and legs. Your end-of-the-week reward (ha!). Includes a warm-up based on the cardio challenge workout followed by the fight, which is an all-round, fully-body, mega-intense workout incorporating cardio, resistance and ab exercises, including some Insanity classics such as stance jacks and hit the floor. Expect another plyometric style workout, with a lot of exercises, many of which are new. A real sweat-fest (hence the name) that reminded me of Pure Cardio from the original Insanity, due to it being a non-stop workout with similar moves such as hit the floor. Similar to Tabata Power from the alpha phase, but with 45 seconds of work, rather than 30. Has an emphasis on burning the muscles out, with hold-type exercises such as pulses, hold squats and chair holds. As you’d expect, this is a more challenging version of the tabata strength workout from phase 1, with continued development of the upper body. Expect even more push-ups. This is probably the most intense workout of the program. It is a full-body workout with lots of exercises, including a wide array of jump variations, that will keep you sweating and your heart-rate high. When you order Insanity MAX:30 now, you get 2 additional free workouts: Pulse and Ab Attack:10. These are both optional workouts and are not required to complete the program, but they make great additions. In short, Pulse is a recovery style workout which incorporates some stretching and the ‘pulsing’ exercises, which you’ll be familiar with if you’ve completed the original Insanity. Ab Attack:10 is, you guessed it, a ten-minute workout focusing solely on getting you rock-hard abs. As you can see, the exercises within the workouts are cardio- and tabata-focused. Tabata, if you’re not familiar with it, is a method of exercise developed by the Japanese scientist Dr. Izumi Tabata, who discovered that you get the best fitness results by working out hard for 20 seconds, and then resting for 10 seconds. Max 30 uses a lot of tabata to get the most fat burning and muscle building in the least amount of time. I’m not a fitness specialist, but I have to say that Dr. Tabata’s work sure seems to have done wonders for me. Additionally, a lot of these exercises are high impact and high effort. If you struggle with high-impact exercise, perhaps due to bad joints, then you should take a look at PiYo or read my PiYo review as an effective alternative without the high-impact exercises. Treadmill junkies beware, Insanity MAX:30 is not your mother’s cardio. You will be pushed, and there is no rest between exercises like in other Beachbody programs. You go, and go, and go, and then suddenly you’re done. I can’t think of another exercise program that has gone as fast for me as MAX:30, despite the fact that it’s half as long as P90X and twice as hard, from a cardio perspective. Insanity MAX:30 Review – Who Is It For? If you’re coming from a less challenging program such as P90 or PiYo, you’re in for an awakening. This program is INTENSE. I use capital letters sparingly, my friends, but in this case they are called for. The workouts don’t allow for any rest, and if you think that because the workouts are 30 minutes long that they’re going to be easier, you’re wrong. Max 30 takes half the time of the original Insanity but can give you the same results. But we know that there are no shortcuts in fitness: the time saving function of the workout comes at the cost of resting time, water breaks, and long stretches, and even if you’re an athlete, you will be feeling the burn. There’s no shame in using the modifier, people. You will sweat, burn, and you will love it. For people with more experience, MAX:30 will really up your game, and I think the difficulty of the program makes it a great option for people who want to up the ante and push themselves. However, if you have never worked out a day in your life, don’t jump into MAX:30. Start with something a bit easier, say, T25 or P90. That said, if you’re feeling daunted but you’ve done a little working out in the past, I would encourage you to give MAX:30 a shot. There are modifiers for every move that, while not sacrificing on difficulty, make the moves more accessible. The short time frame makes it easier to approach the exercises, and by the end of the program you’ll really have a great fitness foundation, and you’ll probably be ready to give the program another go without using the exercise modifiers. If you are recovering from an injury, are in physical therapy, or maybe just have terrible joints, Insanity MAX:30 is probably not for you. The moves involve a lot of getting up and down (suicides, burpees, etc), and this might be too much for those who have real health problems. In general with any at home workout program, good shoes are important, and I recommend buying a pair of cross trainers, NOT running shoes to do this exercise. I strongly recommend PiYo as a low-intensity, low-impact alternative. I can honestly say that Insanity MAX:30 has been one of the most difficult and rewarding home workout programs I’ve ever done. The high production quality, difficult workouts, and inspiring coach made it a program I ended up really enjoying, except, of course, when I was collapsed on the floor cursing Shaun T for putting me through this. And then the next day, I came back and, as time went by, watched my max out times creep higher, which was extremely motivating. Though I didn’t do the program to lose weight, I dropped 11 pounds and gained some muscle definition that I’m really happy with. I’m definitely feel like my stamina has increased. The program is difficult and not for novices, but I found it rewarding and useful, and I would recommend you give it a shot if, like me, you enjoy fitness and aren’t afraid to go the hardest you’ve ever gone for the shortest amount of time. At this point, I almost always recommend purchasing the product directly from the vendor to take advantage of their offers or payment plans and avoid any increases imposed by a reseller, however, in this case I’ve discovered that you can get different versions of the Insanity MAX:30 bundle on Amazon, similarly to the the different P90X kits, whereas only one bundle appears to be available directly from BeachBody. As the kits vary significantly by price and contents depending on which kit you purchase and from where, I’ve simplified this part by drawing up the table below which details exactly what’s included. As you can see, the Insanity MAX:30 Deluxe bundle from Amazon includes so much more. Sure, it costs more, but the included items are things that you will actually use, unlike some of the useless ‘free gifts’ that come with some other home workout programs. So, which is the recommended kit? Well, it should be obvious that, if you just want the Base kit, you should buy it directly from BeachBody: it’s cheaper and includes the 2 bonus workouts that you don’t get in the base kit from Amazon. You want to significantly develop your abs and core. 3 of the 5 bonus workouts focus solely on building that all-important six-pack! Finally, if you want the six-pack building bonus workouts but can’t justify spending the $178.18 when you already have the accessories, you could buy the Base kit from BeachBody and purchase the additional Ab Maximizer workouts from Amazon. I hope this Insanity MAX:30 review has been of some help. If you have decided that it’s not for you, then perhaps check out some other home workout program reviews instead.